The island's ancient name of Vava'u suggests the original inhabitants of this 7 million year old island arrived from Tonga, and interestingly, there is no "B," in the local Tahitian language, so its actual name is Pora Pora, meaning "first born." 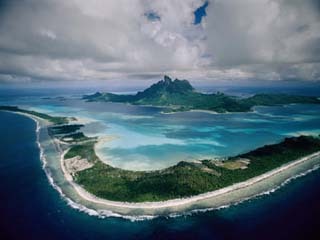 Under the leadership of Admiral Abel Aubert Dupetit Thouars, Bora Bora was named a colony of France in 1842. The onset of World War II brought U.S. troops to the island, and seven massive cannons were set up around the perimeter, as well as a number of forts. The presence of the troops was generally accepted, and lucky for the natives (and troops alike) no combat took place on the island during the war. The U.S.military base officially closed on June 2, 1946, and the abandoned base became an international airport until Tahitiopened their own in 1962. Bora Bora relies heavily on the tourism industry to fuel its economy, and its fabled blue lagoon is - according to novelist James A. Michener - "So stunning, that there are really no adequate words to describe it." 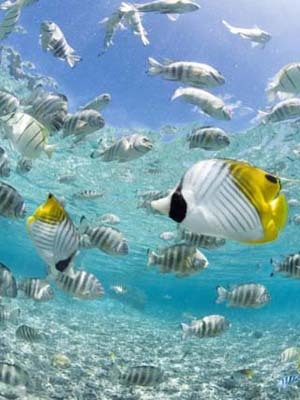 French Polynesia is an overseas possession of France. Its flag depicts a canoe (piroque), sailing under a golden sun. Its crew of five is representing the five islands groups; the Austral, Gambier, Marquesas, Society and Tuamotu chains. Red and white are traditional Polynesian colors. Located in the Leeward group of the Society Islands of French Polynesia, Bora Bora is a volcanic island surrounded by a vibrant blue lagoon and barrier reef. Much of Bora Bora's landscape is composed of luscious green hillsides and black volcanic rock that blends into a jagged coast bordered by white sand beaches. The twin peaks of Mount Pahia and Mount Otemanu lie within the center of the island, and are the remnants of one extinct volcano. At 2,385 ft (727 m) Mount Otemanu is the highest point of Bora Bora; Mount Pahia peaks at 2,159 ft (658 m). Despite being known as a "tremendously pricey destination" tourists from all over the world travel to Bora Bora annually to enjoy its idyllic beaches. While snorkeling, scuba diving, and other various water activities are the most popular attraction, tourists can also visit the Marae Temples, spend the afternoon hiking along various trails across the island, or visit the many shops and art galleries in the markets. 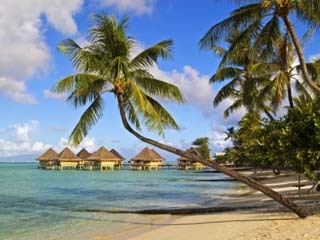 The summer months in Bora Bora (November - April) are hot and humid, with many sunny days. The balance of the year is slightly cooler and drier. 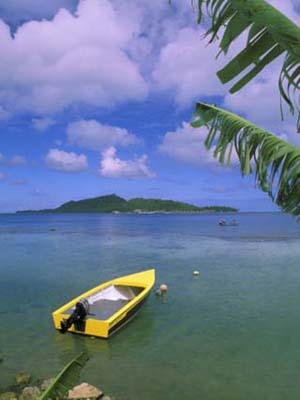 Cooling trade winds buffet the island throughout the year, and the months of June, July, August and October are widely considered to be ideal times to visit. Frankly, there's never a bad time to travel to Bora Bora.